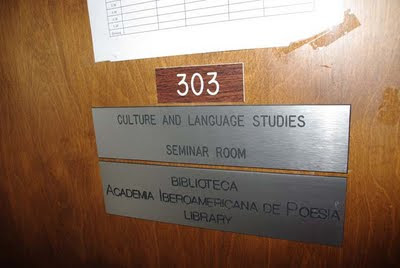 Thursday evening, 29 Oct 2009, was the Inauguración oficial de la Biblioteca, housed in Carleton Hall Rm 303, on the UNB-Fredericton Campus. 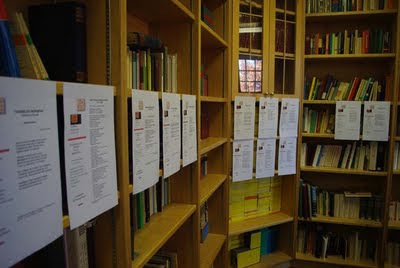 The Biblioteca/library of the Capítulo de Fredericton de la Academia Iberoamericana de Poesía has been given shelves in the Culture and Language Studies Seminar Room. I arrived late, as things were winding down, without camera because I'd just been in 2h 50 min class further up the hill. Had a glass of wine and a biscuit. Went back yesterday and took a few photos of the Inauguracíon's Exposición de Poemas Póster. 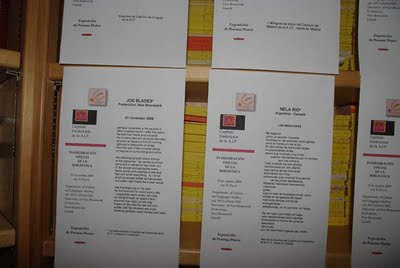 Nela had drawn in poems from other chapters of the AIP and poets in Montevideo, Madrid, Washington, Montréal, Barcelona and elsewhere. The Inauguración oficial de la Biblioteca started with a session of the NB Latino Association's book club. Other people, especially Carlos Morales, have photographed the event the the people in attendance for the Capítulo's documentation. 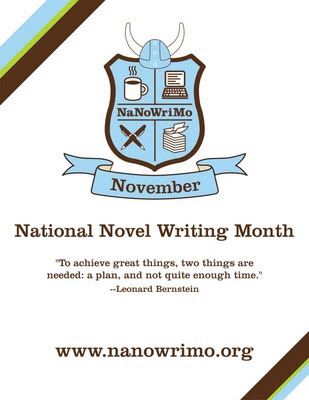 to write a novel in one month? Have you been told that you're full of it? Do you have 50,000 words to get out of your system? Live guests: Corrina Chong & Jeremy Whiston—two of Qwerty magazine’s co-managing editors—in discussion on this UNB English Dept. grad students magazine; the 21 Oct launch for issue 24; their contest; the QWERTY Reads series; and much more. Found face down @ 1:30 pm, today, 20 Oct 2009, in the remnants of a small copse of woods beside the new(er) service entrance road/drive to the Sodexo operation in the UNBSTU Student Union Building off Pacey Drive, UNB-Fredericton campus. 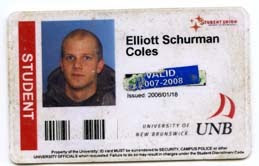 Obvious who is in the photo: Elliott Schurman Coles. The question is how/why did he lose his ID card? Where is he now? Shopping as an en route pastime at Charles de Gaulle Airport, Paris. Joe, in Terminal F, waiting and waiting for the connecting flight. @ the opening of the 5th International conference of Central European Canadianists, in the grand Alba of Sofia University, Bulgaria. @ Panel session C3: Literature 2, Alexander's Ballroom, Radisson Hotel. Chair, Madeleine Danova (2nd from L); panelists Galina Avramova, Dimiter Alexandrov, Vesna Lopicic,and Ana Olos. Looking out of Flannagan's Irish Bistro/Pub, Radisson Hotel, across Narodno Sabranie, Sofia. Dancers, conference delegates, and other customers @ "Veselo selo" restaurant, Sofia, Saturday night party with big food and musical entertainment. Jelena looking at the current issue of Air France's magazine. A rainy view of Nis in southern Serbia. it does not feel like 6 pm . . . Shut Your Mouth and Open Your Mind: The Rise & Reckless Fall of Lenny Bruce, Chapters 6–7. Writing Hurts Like Hell: two student writers in Biff Mitchell’s workshop/class live on the show, Kari Haines and Nikki Thériault, discussing fan-fiction and the course’s writing exercises with a brief reading by each of a dream piece. Love could be transferred by black crow feet too. Owls are traditionally thought to be wise. Baby, don’t worry, I can feed you now. Why is crow looking down instead of looking up: sky is overhead? An alone crow flies. His tears drop in the sky. with everything and won for life and this an example for us. Crow is avarice I want to sail like crow I just want to survive myself. 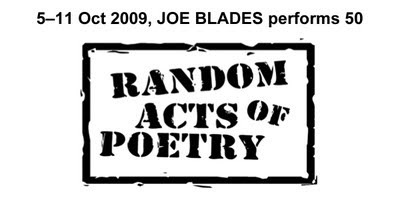 —Written 7 October 2009 during a Random Acts of Poetry presentation by Joe Blades at the Multicultural Association of Fredericton’s Level 3B English Second Language class by Sungoh Jang, Feridoon Farahi, Dac Phong Le, Yohwan Cheon, Sonia Kyunghee Kim, Iran Jahansouz, Marinela Dragos, Sungbum Lee, Manisha Varma, Ke Zhang, Peggy MacIntosh (ESL instructor) and Joe Blades. 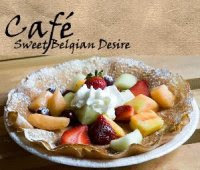 First live guest was Katherine Adams co-owner of Café Sweet Belgian Desire, Charlotte Street Arts Centre, 732 Charlotte St, Fredericton who discussed the café, its food, and café culture in Belgium and, hopefully, here in Fredericton. Student specials (with ID) on Tuesdays in October 2009. In the second half of the show Peter Toner (STU Anthropology) & Mark McLaughlin (UNB PhD student, History) discussed the just-published book Exploring the Dimensions of Self-Sufficiency for New Brunswick (NBASRDC) and St Thomas University’s New Brunswick and Atlantic Studies Research and Development Centre. Random Acts of Poetry here! They've started! Could have started them after midnight while at Mark Jarman's house having "coffee", as Ross called it, [in reality a selection of Pump House and Propeller ales] after the final readings of UNB's sixth annual Poetry Weekend. Could have read to some of the other poets there but didn't have my full RAoP kit with me. Was on Information Morning, CBC Fredericton, an hour ago and that's where I committed my first Random Acts of Poetry for the week/year. Now I'm have my first coffee and am preparing to "Paint the Town with Poetry"!